Meet Gisbert, a tall, young giraffe. 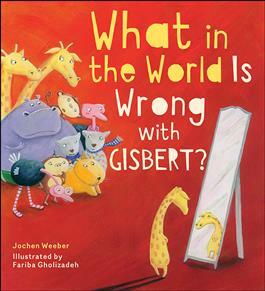 Gisbert is tall enough to do everything a giraffe might want to do, and his life is good. But one day, something happens. Gisbert’s friends start making fun of him, and with each negative comment they say, he begins to shrink! What in the world is wrong with Gisbert? This insightful book helps teach children about the consequences of bullying and the power of friendship. What in the World Is Wrong with Gisbert? features various animal characters and bright, playful illustrations. Ideal for children ages 3-8.